The 10.5-inch Galaxy Tab S4 or Huawei's 10.8-inch MediaPad M5 Pro looks like wider and more than Samsung's current flagship tablet. Which makes us believe that Samsung's next high-end tablet might feature a widescreen display similar to a larger than the 12-inch Galaxy Book2, a Windows 2-in-1 hybrid tablet (tablet and laptop) that competes with Microsoft's Surface Pro 6. Now, to the piece the resistance. Although Samsung officially sho Last October is a prototype of its foldable phone concept with a similar clamshell design, it looked much bulkier and thicker than the one on the teaser video. However, the front display looks much smaller than the back one, which reminds me of the ZTE Axon design. Also, unlike the royale FlexPai, Samsung's foldable phone looks completely flat without that ugly rubbery hinge. However, I suspect that the device shown in the leaked Samsung commercial is the entry-level model (S10 Lite), with an all-screen thin bezel " flat " display, with no curved edges, a dual-rear camera, and a mainstream fingerprint reader. I've included below the link to Samsung's ad: the South Korean company had taken it down, but it was later re-uploaded by Slashleaks. 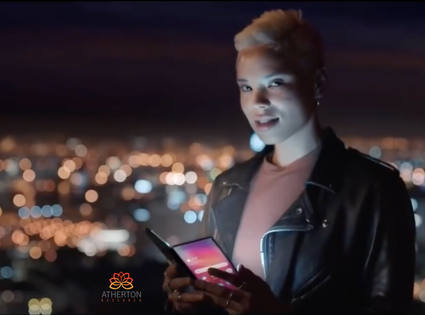 In a teaser video uncovered Friday by Slashleaks, on website specialized in aggregating tech leaks Samsung's Vietnamese subsidiary accidentally leaked upcoming mobile devices that the South Korean company plans to unveil later this month including a foldable phone and the next-generation of its flagship smartphone, the Galaxy S10, and the Galaxy Tab tablet computer. The video first shows an all-screen tablet with a stylus – Samsung sells the S Pen stylus that works with some of its high- end tablets and smartphones – that looks larger than just Apple's latest 12.9-inch iPad Pro. Which makes us believe that Samsung's next high-end tablet might feature a wide-screen display similar to larger than the 12-inch Galaxy Book2, a Windows 2-in-1 hybrid computer (tablet and laptop) that competes with Microsoft's Surface Pro 6. Although Samsung officially showed off last October a prototype of its foldable phone concept with a similar clamshell design, it looked much bulkier and thicker than the one on the teaser video. However, the front panel looks much smaller than the back one, which reminds me of the ZTE Axon M design. Finally, the video continues showing Samsung's next-generation flagship smartphone, the Galaxy S10. However, I suspect that the device shown in the leaked Samsung commercial is the entry-level model (S10 Lite), with an all -screen thin bezel "flat" display, with no curved edges, a dual-rear camera, and a mainstream fingerprint reader.